After you create a Task, you can assign a Taiga user to work on that Task. You can do that from the details page of that Task or from the details page of the User Story to which the Task belongs. On the Sidebar, under the current status of the Task, click Assign. Note: Click Assign to me to automatically assign the Task to your Taiga user. This action opens the Select assigned to form. On the Select assigned to form, search for a user and then click the name of that user. 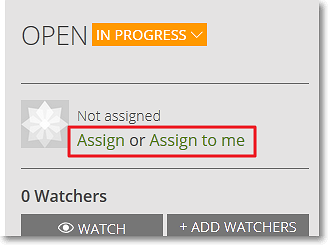 The Task is now assigned to the user you have selected and the name of that user is displayed on the details page of that Task, on the Sidebar, under Assigned to. In addition, that user can see the Task on the DASHBOARD in the Working on section. To assign the Task to another user, click the name of the user to which the Task is currently assigned and then follow step 2 described above. Note: To remove the user assigned to a Task, on the details page of that Task, on the Sidebar, position you pointer over Assigned to, click and then confirm your action.